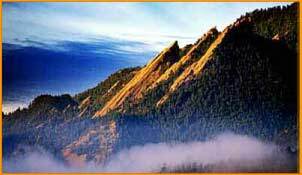 Boulder, Colorado is a magical mountain town offering the cultural amenities of a city and the outdoor activities of a vacation resort. You'll find a full menu of uniquely Boulder experiences described here. Detailed information on Boulder entertainment, outdoor activities, and events is provided for your reference; and a unique collection of Boulder-related web links will help you explore our community in more detail. Generously brought to you by Total Site, Inc., we hope you find this site to be a great resource.